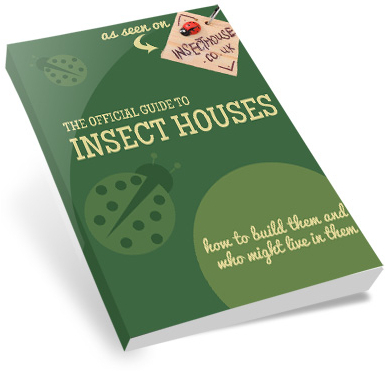 After weeks of refusing to be hide-bound by anything as prescriptive as design, we eventually had to come up with specific insect house designs in response to a flurry of commissions. Building to a plan can be much more efficient than doing it freestyle and we also had to start working to standard dimensions and weight in order to make the postage work. 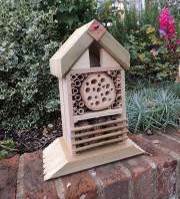 You can see the results in the “Buy your very own Insect House” photo down on the right. We usually fill the space on the left with twigs and canes and stuff the “attic” with Scots Pine needles (take a handful of pine needles, riffle them more or less into line and then trim them with some scissors). The space on the right is for pine cones or bamboo canes which we then hold in place with a couple of small slats or short sections of thin cane, knocked in with panel pins. Here’s a more flamboyant design and we really like it. 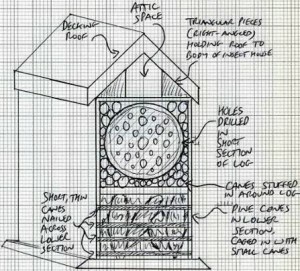 We cheated a little bit here and recycled an old wooden CD rack to form the basic structure of this insect house design. We then cut a short section of a log which we drilled with holes in a variety of diameters. We fixed it in place with a screw through the back of the box and then packed the edges around it with canes and twigs, tapping them down with a hammer to make sure they were tight and nothing was going to fall out. We fitted a floor under the log and then filled the lower space with pine cones which we “caged” in place with sections of thin bamboo cane held in place with panel pins (a rare use of nails for us!). We drilled pilotholes through the canes first so they didn’t split or shatter. We topped the whole thing off with a nice gable roof and left the attic space empty, hopefully to attract butterflies. We fixed some triangular shaped bits of wood to the top of the box and then screwed the roof to these. 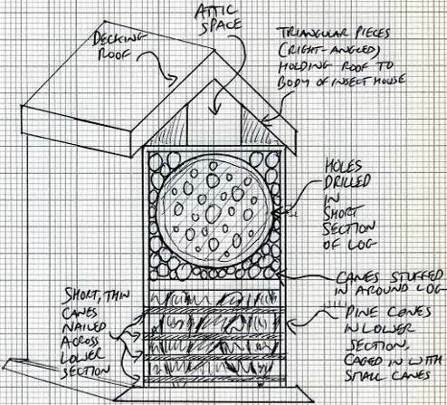 As well as holding the roof in place, they should also provide a bit of shelter to the attic. Finally we added a sturdy base, as much for looks as for anything else. We were really pleased with the results and we reckon it would look as good on the mantelshelf as in the garden!